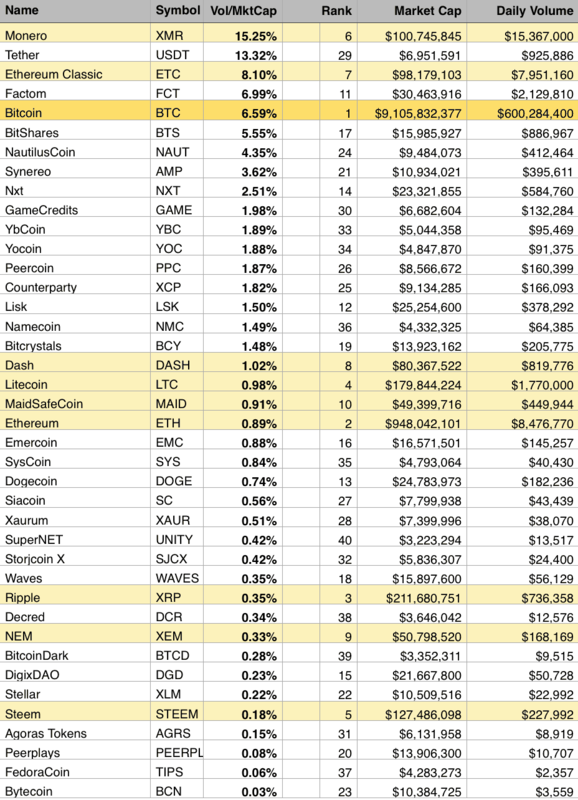 I ran the numbers on 24hr traded volume (liquidity) vs market cap for the top 40 altcoins to highlight any suspect valuations. You could say it’s a shitcoin detector, LOL. The idea being that an altcoin that has a low ratio of traded volume vs its market cap has a suspect valuation due to insufficient trade volume to support accurate price discovery. Interestingly Steem, NEM, and Ripple came up as red flags. For comparison. A high cap stock such as Apple would come in at 0.5% and US M1 money velocity (cash and cheques) would be around 2%.